The basic easyDCP KDM Generator enables the creation of Key Delivery Messages (KDM) for digital cinemas. easyDCP KDM Generator+ additionally allows to use external DKDM (Distribution KDM) generate KDMs. A KDM allows the playback of an encrypted DCP for a certain time window on a specific playback device. With this tool one can easily generate hundreds of KDMs within a single run. Besides the KDM generation tool we offer the creation of a personalised and DCI-compliant digital signature for all our easyDCP KDM Generator customers. This enables you to sign your generated KDMs and your customers can be certain that your KDMs are trustworthy. easyDCP products are constantly being improved by Fraunhofer IIS to keep up with the standards and technical frameworks of digital cinema. With Fraunhofer IIS represented in the SMPTE Board of Governors, users of easyDCP software have the certainty to always work compliant with D-Cinema standard. 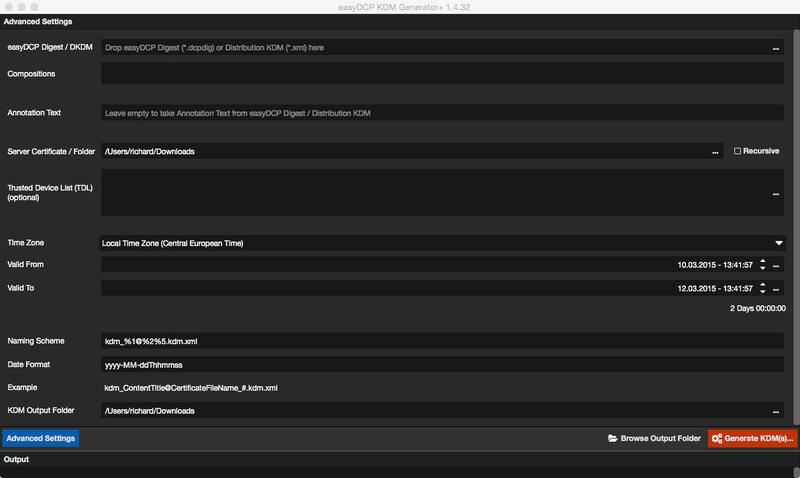 For a first experience with this software we offer a free download of a special trial version easyDCP KDM Generator+. The trial version allows a KDM with validity of 2 days.